The prime minister confirmed Saturday afternoon in Argentina that he'd "directly" approached both Russian leader Vladimir Putin and Saudi crown prince Mohammed bin Salman at the G20 summit. Canadian officials have been openly critical of the actions of both Russia and Saudi Arabia, and in an open forum with their leaders, Prime Minister Justin Trudeau didn't back away. The prime minister confirmed Saturday afternoon in Argentina that he'd "directly" approached both Vladimir Putin and Mohammed bin Salman at the G20 summit. Trudeau explained he'd conveyed Canada's concerns to Putin at the leaders' plenary session, particularly with the situation in the Sea of Azov, where Ukranian boats were attacked by Russian vessels earlier this week — and reiterated the demand that the captured sailors be released. Canada has also spearheaded a G7 foreign ministers' statement that condemns Russian aggression in Ukraine, Minister Chrystia Freeland confirmed earlier this week. There wasn't opportunity for Putin to respond at the leaders' retreat, Trudeau said when asked if he was worried about repercussions from Russia. In his conversation with Saudi Arabia's Prince Mohammed bin Salman, Trudeau said better answers about the killing of journalist Jamal Khashoggi were required. He also pushed the issue of imprisoned human rights workers and the "humanitarian catastrophe" from violence in Yemen. "I made it clear Canada was concerned." Trudeau said he stressed the fact that Canada will "always stand up strongly and clearly for human rights." All eyes have been on the Saudi crown prince during the trip, which marks his first major overseas appearance since the killing of Khashoggi in October. Though the leaders spoke, Trudeau did not hold official meetings with either Putin or bin Salman. With Russia's previous cyberthreats and Saudi Arabia's poor reaction — freezing trade and investment — to earlier criticism of their human rights record, backlash could be a possibility. However, Trudeau didn't seem too worried. "Frank and direct conversations … is better than not talking," he told reporters. U.K. Prime Minister Theresa May and France's Emmanuel Macron were more forceful in their condemnations of Saudi Arabia. May's office says the prime minister stressed to Salman the importance of ensuring those responsible for the "appalling murder" of Khashoggi are held to account. Macron also came face-to-face with the Saudi crown prince, and an official said the tense exchange captured on video shows the president's firm stance. Canada is also ramping up its response. On Thursday, Foreign Affairs Minister Chrystia Freeland announced Canada was imposing sanctions on 17 Saudi Arabian nationals the government deems linked to Khashoggi's killing at the Saudi consulate in Istanbul. G20 nations skirted current global trade tensions, but threw their weight behind reforming the World Trade Organization in a copy of their end-of-summit joint statement obtained by Reuters. In the communiqué, which was set to be released at the end of the two-day meeting Saturday, the United States also reaffirmed its commitment to withdraw from the 2015 Paris Climate Accord, while other G20 signatories to the agreement declared the pact irreversible and said they would fully implement it. 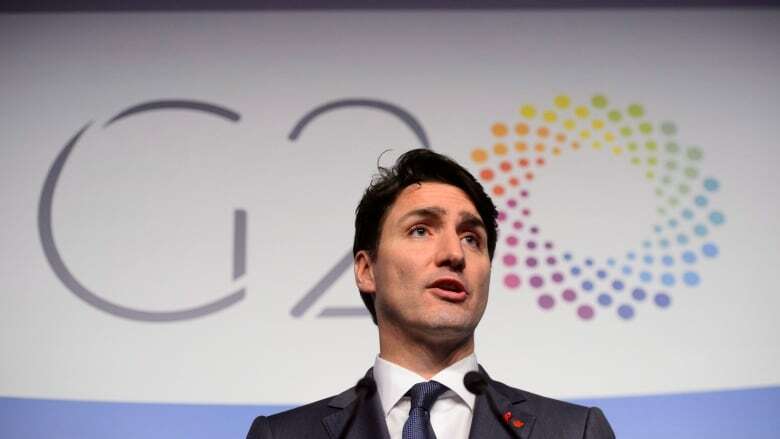 Despite the withdrawal and some trade tensions, Trudeau still praised the summit for making progress on multilateralism, trade, climate issues and gender equality. The agreement is more watered down than it has been in past years, but Trudeau said any time countries can come together to discuss big issues it's a "good thing." "No country can solve global problems on its own," he said.